Though the joys of June are many, beware the dreaded summer reading slide. The easiest way to keep reading skills bolstered while the sun shines hot is by enrolling in the local public library summer reading games and offering kids books that are so fun, they feel like the furthest thing from homework. Here are a couple choices that are the most painless, page-turning reading and imagery mash-ups since MAD Magazine. 13-Story Treehouse series by Andy Griffiths, illustrated by Terry Denton (Feiwel and Friends). Follow the adventures of besties Andy and Terry (coincidentally, the name of the author and illustrator) as they make additions and improvements on their treehouse (man-eating shark tank, rollercoasters, baby dinosaur petting zoo, antigravity chamber, lemonade fountain, ice cream parlor with robot scooper, high bounce trampoline, to name a few), hang out with their animal-loving neighbor Jill and her flying cats while having adventures (like unveiling a sea monster disguised as a mermaid or battling vengeful vegetables)and desperately trying to make deadline for their cantankerous publisher, Mr. Big Nose. I am beside myself with the genius of this series. Honestly. 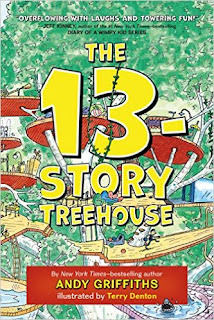 The 13-Story Treehouse and its sequels are the best thing to happen to kidlit since Captain Underpants, and, sorry, Dav Pilkey, surpasses it by a country mile...in other words, these books are a major event in children's literature and a must-have in every library. The imagination of this graphic novel hybrid is truly incomparable, and the hilarious storytelling/artwork combination is seamless, as though the Andy and Terry in the book have come to life and really are working together to tell these stories, an incident of real live book magic. Like potato chips, I could not stop with one...could they actually keep this pace and maintain this almost psychedelic level imagination? Yes and yes. Any summer reading goal is easily met through the entire series, including the 26-Story Treehouse, 39-Story Treehouse, 52-Story Treehouse. After all, who wouldn't want to spend their summer in a treehouse? The Complete Adventures of Johnny Mutton by James Proimos (Houghton Mifflin Harcourt). Three words: LAUGH. OUT. LOUD. One more: VERYHARD. Johnny Mutton was a baby sheep that was left on a doorstep and raised as a naive, well-meaning little boy. All of his comic adventures from three volumes are compiled here. Johnny gives away all of the cupcakes meant for a cook-off, throws an unpopular party, dresses like a nose for Halloween, is a good sport at a spelling bee and many more adventures in the three books worth of comic adventures compiled into this one strange and brilliant treasury. 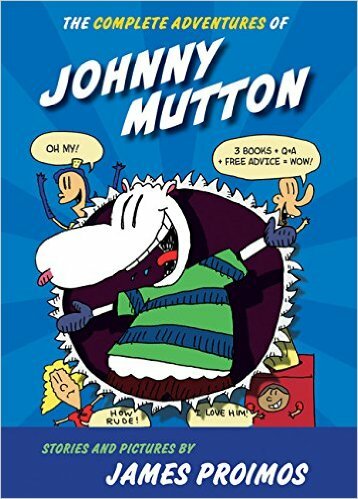 Loose line drawing and an odd but addictive vintage Zap Comix quality, it also offers an optimistic spirit, affirmation of individuality ("Johnny Mutton! He's so him!") and an insight into the human condition that makes it brilliant for all ages. If Spongebob and James Marshall had a baby, it would be Johnny Mutton. Like his mother says, "I love you, Jonny Mutton! 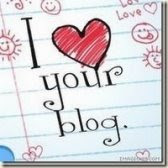 There is no one quite like you." 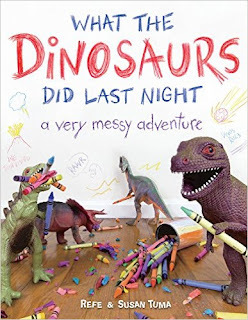 And I was a little late to the party on this one, but still so pleased to discover What the Dinosaurs Did Last Night: A Very Messy Adventure by Refe and Susan Tuma (Little Brown). Posed plastic dinosaurs wreak havoc all around the house, culminating in a mud-covered mess in the living room that would even have No, David! shaking his head. Though the photos have so much havoc to discover, the volume is slim. If this story time sized intro to these anthropomorphic antics leave you wanting more, I hear tell there's an even bigger collection for fans that will engage older children as well. Naughty is always nice when it comes to reading, and anyway, who ever heard of a well-behaved dinosaur? Velociraptors don't care. Follow up on the fun by letting toys take some selfies, with your help. What children's books make you and yours laugh the hardest? Links for information. Please support your local independent bookseller.